VANCOUVER, BC – Sampler packs and collaborative releases have both become common occurrences in the craft brewing world, but in what may be a first for Canada, Parallel 49 Brewing is bringing them together in a unique and ambitious way. 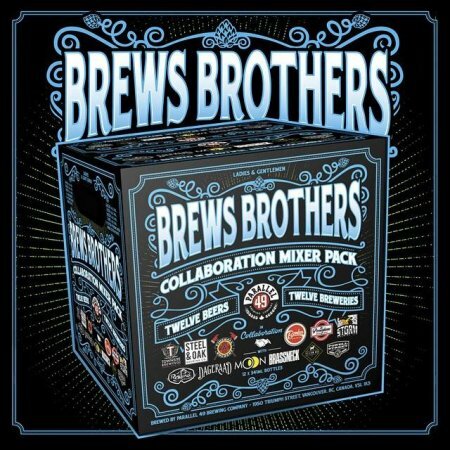 The Brews Brothers Collaboration Mixer Pack is an upcoming release featuring 12 beers, each of them brewed by Parallel 49 in collaboration with a different British Columbia brewery. The list of participants includes Townsite, Steel & Oak, Firehall, Bomber, Persephone, Storm, Rossland, Dageraad, Moon Under Water, Brassneck, Yellow Dog and Powell Street. Further details on the beers brewed for the package are still to be announced, but in the meantime, the Brews Brothers page on the P49 website reveals details of several events marking the release, including a launch parties at St. Augustines in Vancouver on March 30th, and Moon Under Water in Victoria and Kettle Valley Station Pub in Penticton on March 31st. Tap takeovers in Vancouver, Calgary and Edmonton are also planned for late March and the first half of April. See the website for more information. Thanks – completely missed that somehow!